The ancient people, upon discovering that water in a pottery often leaks out drop by drop, made a pottery kettle with a small hole in it. Water filling the kettle would leak out through the hole, and another kettle was used to collect the leaking water. A marked arrow, like the dial of today’s watch, was placed inside the second kettle through the hole of the kettle lid, floating on top of the water with the support from a bamboo flake or a wooden plate. The kettle was known as an “arrow kettle”. As the water level rose higher, the arrow also moved upwards, and people could know the exact time by looking at the marks on the arrow, known as ke. Clepsidra gradually evolved into a set of four pots. 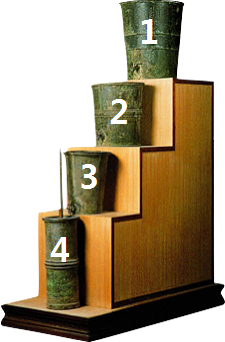 These are placed in order on a four-level wooden stand, the one on the highest level called the Sun Pot 1, and below it the Moon Pot 2, Star Pot 3 and Water-receiving Pot 4, respectively. The Sun Pot, Moon Pot and Star Pot all have an opening at the bottom for water to leak through, and the Water-receiving Pot has a gauge inside. The water drops from the Sun Pot into the Moon Pot and then into the Star Pot and finally into the Water-receiving Pot. As more and more water drops into the Water-receiving Pot, the gauge gradually rises with the buoyancy of water. And thus people could tell the time through the scale above the water. The more levels the clepsydra has, the more accurate it is. Function of the Water receiving pot 4 is the indication of 100 ke or cuts every 14,4 minutes. Water Receiving pot receive water from the Star pot 3. Drops from the star pot must fall into the Water Receiving pot with same frequency which may be maintained only through keeping same water pressure in Star Pot. Moon pot 2 function is to keep same water pressure in Star pot 3, keeping water in Star pot at the same level. To keep water pressure in Star pot 3 at the same level water from the Moon pot should fall with the same frequency as from the Star pot, which may be adjusted by keeping water in the Moon Pot 2 between two horizontal lines as on the picture and by adjusting opening from the bottom hole. Sun pot 1 keep water level at the Moon pot 2 by keeping water between it's own two horizontal lines. Horizontal lines is the indicator that the pressure in all pots is the same. Synchronizing fall of the water drops make water clock work very exact. More pots more exact water clock is. How ancient Chinese could adjust water clock to have exact time? So how ancient Chinese could adjust their water clock every day to have exact time? Here we have an answer in the first difficulty of Nanjing. It is the unique moment of the day when Zhong and Wei Qi meet, moment when the arrow with cuts ke rises over 100 cuts. It is a moment of astronomical midnight when pulse makes specific change different of all cyclical changes during the day. It is a reason that many pictures show practitioner or any person controlling the final moment of fifty yin-yang exchanges and start of following fifty yin-yang cycles taking his own pulse. As it was explained earlier about right and left activity of San Cun 3 Cun position, this activity changes every ke 刻 or cut, it is how practitioner could see if clock works exactly every 14 minutes. But in the moment of astronomical midnight when one yin or yang cycle changes to the opposite one, which we can see through cun kou, San Cun activity don't change, as it does always, making possible zhong and wei move from left to the right and afterwards from right to the left as you may see on the picture below. It is very important example how Chinese could control exact time through simple astronomical clock showing in the pulse and could repeat it in artificially made water clock more then 2600 years ago.